So you planned ahead, did some exercise on the days and hours leading up to your Thanksgiving or Holiday dinner, ate a normal breakfast and lunch, you even made some low calorie and healthy alternatives to the traditional foods. 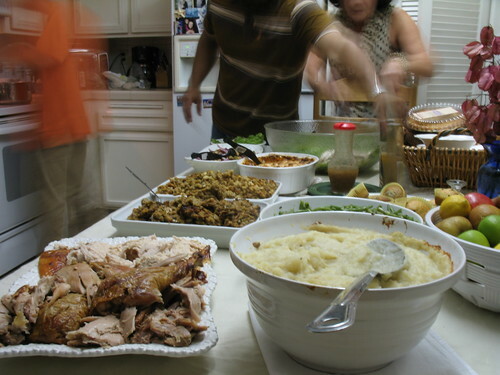 But now you are at the party and confronted with piles and piles of delicious fatty foods. What do you do? Grand Central, originally uploaded by Steven Jareb. Continue drinking water or other zero calorie drinks before the meal. (Tea, coffee, crystal light) Find or create an activity for you and the kids that will keep your hands busy. (Games, crafts, a round of football outside) Chew some sugar-free gum to keep your mouth busy and full. If you do plan to eat some food before the main meal, stick to the veggie platter but skip the dip or have hummus instead of the fatty standards. Consider dishing up a small plate of snacks and sit down (away from the food) to eat them. This will help you keep track of how much you have had and avoid the standing and grazing pattern. If you are helping in the preparation of the food, avoid tasting, sampling and picking. If you DO need to sample, COUNT each bite and track for your overall calorie count. Weight Watchers suggests 1 point per sample. Be assertive. You don’t have to say yes to every offer of food just to be polite. Pick white meat over dark meat and give the skin to the dog. Have your gravy (and salad dressing) on the side and dip your fork in it before getting a bite of turkey or potatoes. This will give you the flavor without drowning your day in calories. As you eat, do it slowly and pay attention to your level of satisfaction. Listen for the groans and sighs around the table. These are obvious signs of fullness. Track your calories by writing down what you have eaten. Or write it down ahead of time, and keep the list close at hand to remind yourself of the plan. Look at your list before you go for seconds. Seeing those HUGE calorie counts can really help you avoid seconds. As soon as you are done, help your host by washing dishes, starting with your dinner plate. Excuse yourself to the powder room and brush your teeth. This is a great signal to your body and mouth that you are done eating. Or freshen your breath and avoid more nibbling with another stick of gum. If possible take a little walk before the desserts come out. Again, select your desserts carefully. Pick ones that are special or that you never get a chance to have on a regular basis. Have little slices and savor the taste. Avoid the whipped topping and ice cream or have the fat free versions. If you stuck with your plan and survived the meal, give yourself a big pat on the back. But if you didn’t brush it off and move on. Tomorrow is another day and the holiday should not derail your overall health and fitness plans. Next, Part Three The day after! This entry was posted in Personal and tagged healthy living, holiday, meals, plans, Thanksgiving on November 25, 2008 by Sheba.